Clubroot is found everywhere brassica crops are grown. And clubroot is getting worse. 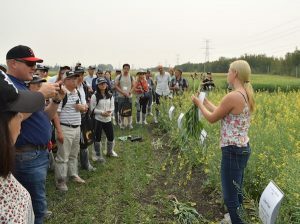 These were the underlying messages from the International Clubroot Workshop, which brought together 200 clubroot researchers, extension staff and growers from around the world to Edmonton this week. Nicole Fox, Masters student at U of A, presents at the International Clubroot Workshop in Edmonton. Presenters at the workshop described the clubroot situation in China, Japan, Korea, all across Europe, Colombia, the U.S. and Canada. It infects brassica crops, including canola, oilseed rapeseed, bok choy, Chinese cabbage, turnips, rutabaga and broccoli. The workshop attracted attendees from Canada, France, China, Germany, Japan, South Korea, Poland, Sweden, United Kingdom, United States, India and Colombia. Tight rotation of host crops is driving the rise in clubroot severity, and researchers around the world are working on various solutions. When six experts in a closing panel were asked to name the one key management step for farmers in Western Canada, four said “longer rotations”, one said to scout earlier in the season and one said to keep clubroot away from the farm for as long as possible. These are important messages for canola farmers in Western Canada. This time of year, scout fields for patches and consider hand roguing small patches to get the spore-producing galls out of the field. Burn the galls. CCC agronomy staff are hearing reports this week of clubroot expanding into more areas of the Prairies, so farmers everywhere should be looking.